Posted 2:36 pm by Administrator & filed under News. At the 17th Annual Chicago Neighborhood Development Awards (CNDA), Hartshorne Plunkard Architecture received the Richard H. Driehaus Foundation Award for Architectural Excellence in Community Design, 3rd Place. Held on February 8, 2011 at UIC Forum, the awards program is the country’s largest awards program dedicated to neighborhood-based development. Sponsored by the Chicago chapter of Local Initiatives Support Corporation (LISC), the event honored community leaders, architects, businesses and the partners that support Chicago community development. HPA was recognized for its architectural design of the Belfort House for Teen Living Programs. Teen Living Programs (TLP) is a non-profit organization that provides a safe and comfortable refuge for youth who have left their homes because of abuse or neglect. 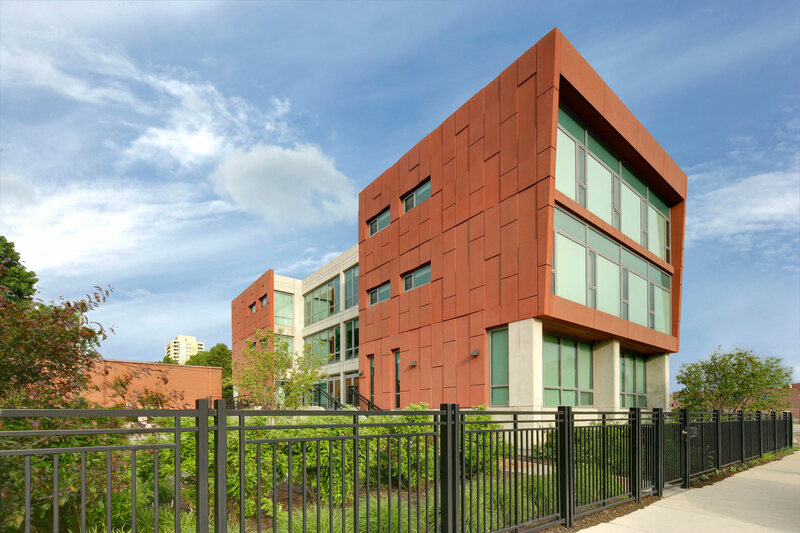 The new Belfort House, located in Chicago’s historic Bronzeville neighborhood, provides transitional residential living spaces and supportive services for at-risk youth. The 12,500 SF building supported the client’s programming needs, including private bedrooms, spacious community spaces, a health clinic, and private offices for counseling sessions. HPA provided pro bono design services for the distinctive building, which makes a signature statement in spite of a modest budget. Precast concrete was used throughout the building for its durability and easy maintenance. The concrete exterior wall panels feature a signature terra cotta color to emanate warmth as well as make the building stand out in the community. Floor-to-ceiling windows flood the building interior with light. To view the complete list of 17th Annual CNDA Winners, click here.